Stamping Lane: Creation Station Blog Hop - "Getting 'Baggy' With It"
Creation Station Blog Hop - "Getting 'Baggy' With It"
Happy September Sunday! I think Mother Nature missed the memo that September weather was not supposed to be the same as mid-July 90 degree days. Blah! It's been so hot here this past week and it's supposed to continue for a little bit yet. I'd take a regular 75 degree September day right about now. We are full into corn chopping, so these hot, hot days make that task much, much harder. Do I dare declare that I don't own any of our single stamps? Nope, not a one. So I knew I would be going with curtain number 2 and highlighting the use of our cello bags. Actually just one cello bag in two different ways! I took one of our fabulous and super cute 1" x 8" Cello Bags and cut it in half. With the first half, I put a few little candies inside and tied off each end with our Rich Razzleberry Cotton Ribbon. I just received the new stamp set, Howl-O-Ween so I thought it would be cute to have the owl actually holding onto this little bag of treats. 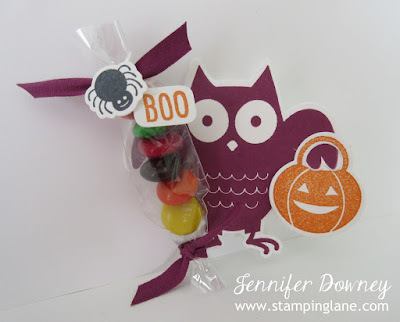 What a cute and easy way to present a little treat to someone! With the other half of the cello bag, I slit it completely open. (Think of butterflying a chicken breast.) Then I accordion folded it and came up with this cute little half rosette. 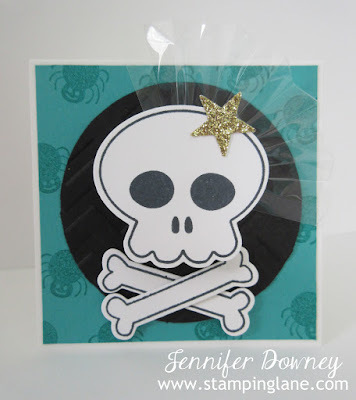 I attached it to the back of the skull from the same Howl-O-Ween set and made this cute little 3" x 3" card with it. I think the cello 'softens' this card a bit. Here it is from the side to give a better view. The 2 1/2" Basic Black circle is textured using the Chevron Embossing Folder. I'm so HAPPY that this stamp set has coordinating framelits with it! Woo Hoo! So here you go. One little cello bag and two different uses. Did I mention there is only 54 days until Halloween? Lots more owls I need to make! Thanks for stopping by today! Depending on where you started on this blog hop, you can go back and revisit Dena's mad stamping skills or you can hop along to see what creative genious Martha has to share with you today!